The Cavalry has a game in hand on United, which will be made up when it plays 2-7 FC Cleburne Wednesday night in Bryan. After that match it plays 3 of its last 4 on the road, including twice in Cleburne. Texas United’s last 4 matches are evenly split home and away, but include two at home against division leaders OKC Energy U23 and a trip to Mississippi to play second place Brilla. The possibility for both Texas sides to finish second were dealt a blow this weekend when Brilla traveled to Oklahoma and took 4 points in 2 matches against previously unbeaten Energy U23. It goes without saying that the 10-2 aggregate advantage undefeated OKC Energy U23 ran up on Houston FC and BV Cavalry in their two victories last week was painful. The league added to the pain when they named Energy U23 forward Julio Moncada PDL Week 7 Player of the Week after the Honduran talent scored three goals and provided one assist in these wins. Moncada attends the University of North Carolina at Wilmington and has played for Honduras youth national teams. He currently leads the Energy U23 in goals with six and has three assists. Energy U23 remain atop the Southern Conference (Southeast and Mid-South Divisions) Power Rankings and now has 28 points in 10 games, 12 clear of Mississippi Brilla. After the weekends results, it is also the first team to qualify for the PDL playoffs, which begin next month. Two second half goals by Alex Reyes and substitute Deniz Sipahi (in stoppage time) allowed Houston FC to come back from a halftime deficit to win 3-2 at The Depot in Cleburne. After Christian Clarke had given Houston a 26 minute opener, Cleburne scored twice before the halftime break, William Taylor and the third of the season from Chris Escalera. Cleburne goalkeeper Joshua Nieto made 6 saves during the loss. Texas United scored three unanswered goals to come back from a two goal halftime deficit to defeat FC Cleburne 3-2 in Keene. Cleburne, playing the third game in a brutal five day stretch (including a trip to Clinton, Mississippi), had built a 2-0 lead in the first 12 minutes from goals by Jose Ponce and Stefan Lukic. Texas United came back and scored three in the final 30 minutes to win. Miguel Velasquez got it started with his 5th of the season and two goals by substitute Alan Rivera, the last in the 87th minute secured the victory for United. 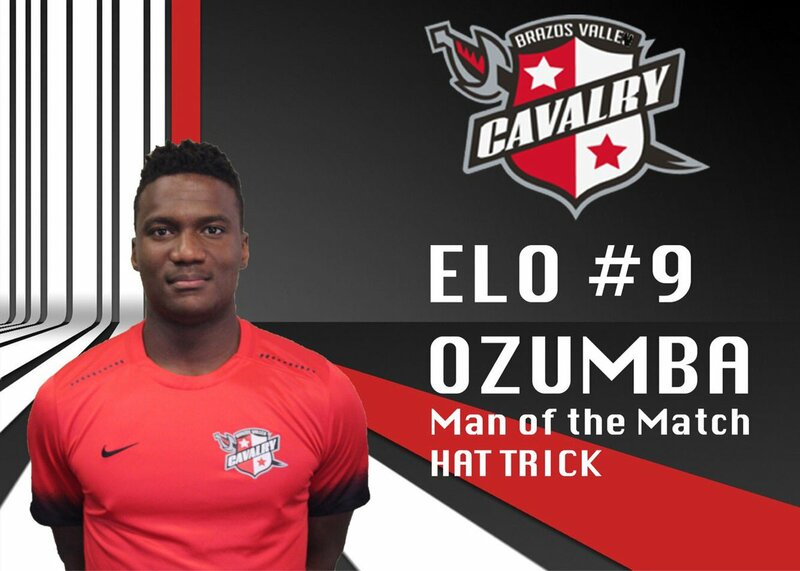 Houston Dynamo Academy graduate and Northwestern University forward Elochukwu Ozumba scored his first, and the Cavalry’s first ever, hat-trick Thursday night as BV defeated Houston FC 4-0 in Bryan. Ozumba didn’t waste any time getting started on the scoring as the first came in the 2nd minute. Two second half goals completed his momentous evening. Midfielder Matt Dorsey completed the scoring off a Robert Hernandez cross for Brazos Valley. The Cavalry outshot Houston 20-6. Not surprisingly, Ozumba had 7 of the Cavalry’s 20. A wild match in Bryan last night. (1) 6 goals-5 in the last 30 minutes. 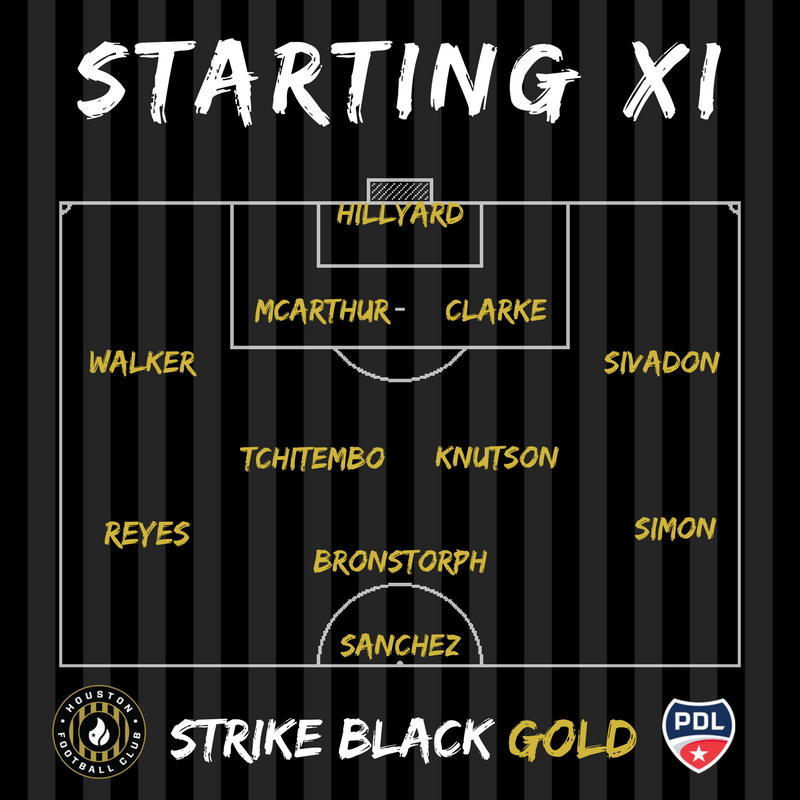 (2) The Cavalry came back from 2 goals down to take the lead on an 87th minute goal by Dynamo Academy’s U18 midfielder, Robert Hernandez, his first in 4 PDL appearances. (3) Then 2 minutes later forward Patricio Botello, from San Antonio and St. Mary’s University, converted a penalty off a rebound following an initial save from a shot off the crossbar. This tying goal was the second of the night for Pato. The other Cavalry second-half goals were scored by Mitchell Cardenas (a penalty earned by defender Zach Jackson) and Elo Ozumba, his fourth of the week. Yousri Ben Othmane had given United the early lead when he converted a rebound off a corner in the 6th minute. The Cavalry had 19 shots on the evening, forcing Texas United goalkeeper Adam Zehme to make 10 saves.